The Figure 8 Lead, a quick and easy fitting lead and head collar in one. Made from our cushion webbing so it is light and soft while long-lasting and durable. Chose from many colours, comes in 19 & 25mm widths. The lead comes in standard 1.25 metres (approximately) for optimum length. 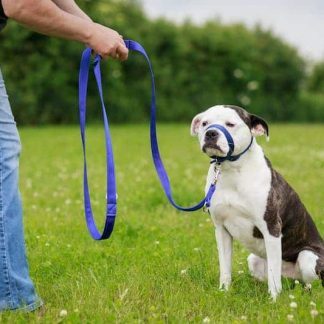 Can in some cases help prevent pulling on the lead. The Figure of 8 Lead is a quick and easy fitting lead and head collar in one. Made from our cushion webbing so it is light and soft while long-lasting and durable. Chose from many colours, comes in 19 & 25 mm widths. We love this Figure 8 Lead as it’s so quick to put on and significantly reduces pulling in most cases. This is a new design as of November 2017, we think it is a great improvement, fully adjustable, turn inside out to work on left or right. The Figure of 8 head collar lead is one of our easiest head collar leads – if you know how. I think the key to using the F8 is to decide which side you are walking your dog and have the lead trailing off in the correct direction. Set the head section out on a flat surface and make sure that the webbing will lie flat on your dogs’ coat. If you walk your dog on the right, the top O ring will be left of centre of the dogs head. If you walk your dog to the right, the O ring will be right of centre of the dogs’ head. Ordered one of these Wednesday night and it arrived by Friday morning! Good length in the lead, not too long but enough that my dog can sniff around a bit of desired! 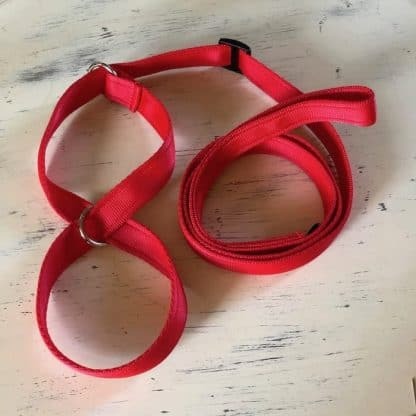 Comfortable material, my dog doesn’t object to it (he has been trained to accept muzzles and headcollar) due to the soft material and it comes in bright colours! Very pleased. We are more than pleased with the new lead and the control it has given us, Dexter is less than convinced! he pulls like crazy. We tried several leads on him with no effect, and finally got a figure of 8 to try. This worked better but was too short, so I still ended up either running at 40mph or on my face in the mud. I searched the internet but all the leads were the same length. 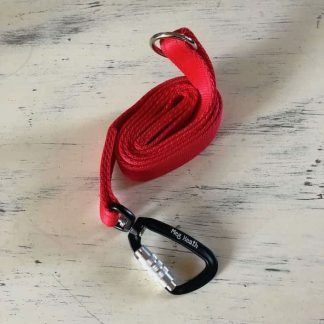 Finally I spotted the MegHeath Dogleads website and contacted Sarah. What a find. The lead arrived very quickly and was superbly made and of great quality. I have just ordered my second figure of 8 lead and will order again in the future.